Consolidate management of hotel stores, casinos, and other entities with real-time consolidated financial and analytical data. Learn how to get things done faster, smarter using a hospitality management software expert. Multi-entity hotel management companies need to view real-time information for specific properties and locations, departments, etc. Most start-ups or smaller hospitality companies use multiple applications to manage their business. For example, they may use an application to run the hotel side of the business, a construction application to manage the construction of new properties and/or a reporting application to consolidate reports across the other applications. As you grow, it becomes increasingly time consuming to manually synchronize the data between multiple systems and locations. Your growing hotel management company needs hospitality software automation to view information for specific properties and locations. You may need to consolidate management of hotel stores, casinos, and other entities with real-time consolidated financial and analytical data. CFOs, controllers, investing partners, property managers and employees need various levels of access with finely tuned permissions. It's important for the right people to have real-time visibility into current inflows, outflows and revenue streams. Integrated payroll, attendance and payments must be available in the multi-entity hospitality software. Hospitality and hotel management companies select Sage Intacct because it allows users to see each facilities' up-to-the-minute data via secure, web-based access. Sage Intacct allows you to consolidate data across hundreds of entities in seconds allowing your finance teams to make data-driven decisions. 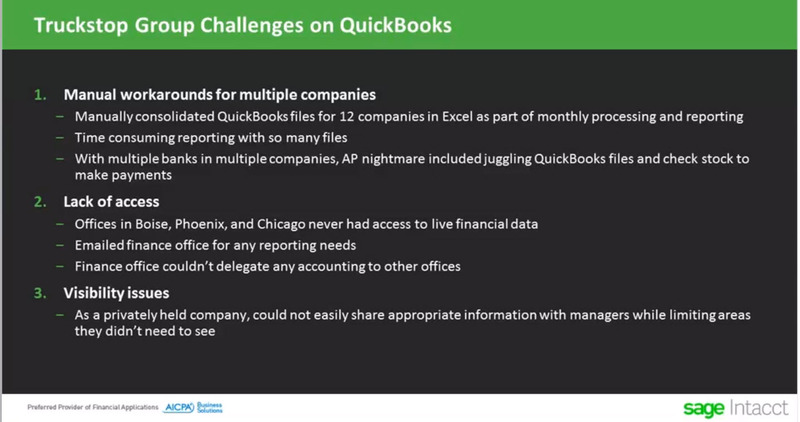 Sage Intacct empowers you to slice and dice data in real-time, eliminating Excel spreadsheets. It's easy to delegate accounting tasks across entities while keeping individual and top-level entities secure. The cloud empowers users to do their job anywhere from any browser on any device with internet access. 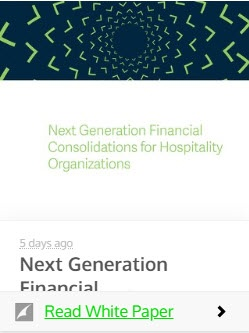 When multi-entity hospitality management companies outgrow entry level software like QuickBooks they require more modern, cloud-based financial management. They require ease of use, straightforward customization, rich reporting and affordability. Integrations with other hospitality software like ResortSuite drastically shortens consolidations. Multi-entity hospitality software enables users to consolidate hundreds of entities without logging in and out. Users are able to quickly slice and dice data using real-time dashboards and virtually eliminate the need to build spreadsheets.